"I guess what inspired the title of this book was this idea of sitting down with God sharing conversation as naked and raw as the coffee I drink." - KIRBY ALFARO Do you know God? Do you really know God? The depressing reality is that most of us don't. 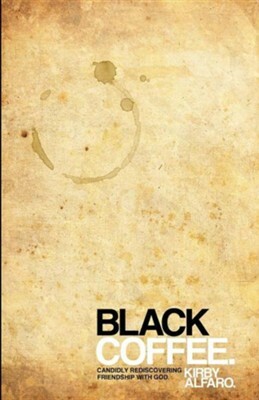 In BLACK COFFEE, Kirby Alfaro confesses that the designer of the universe can seem distant, out of touch, and even unattainable. How do you even begin to build a relationship with someone like God? How do you turn an acquaintance into an old friend? This is not a self-help book bloated with formulas and templates written to touch up your spiritual reputation. Instead, this is a book that asks the tough questions, in hope for answers that bring to light a REAL, UNPOLISHED, BOLD, ROBUST, UNTAMED, RICH, STRONG, RAW, INTENSE friendship with God. Not a friendship to help you feel more like a Christian, but a friendship you've desired ever since the brink of your creation. KIRBY ALFARO is a pastor at Northplace Church in North Texas. He is a frequent speaker on issues relating to Christian spirituality and building relationship with God. He attended Southeastern University where he received a degree in pastoral ministry and a master's in leadership. He lives in North Texas. I'm the author/artist and I want to review Black Coffee.